A couple of weeks ago I wrote about how we value the life of individuals, and the way this is presented in the media. In that post, I named names – I wrote of individuals about whom we can discover more: a photograph, a family, a history. We can begin to relate to such people and thus find value in their lives. It’s much more difficult, however, to value the anonymous. And yet there a thousands of faceless people who make our lives what they are. Thousands of people responsible for the food we eat, the clothes we wear, the computers we use…. the only relationship we have with these people is the through objects – we do not know their stories. Perhaps we should. Perhaps it is our responsibility to understand what goes into producing the objects we interact with every day. How did making the t-shirt you are wearing affect the life of the people who made it? Where did the fibre come from? How was it spun? What chemicals was the person who dyed it exposed to? Where was it cut and sewn together? In a sweatshop? Did someone suffer to make it? Will they continue suffering long after you have thrown it in the bin? 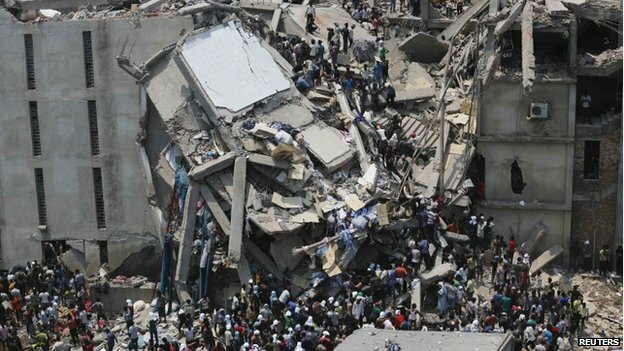 It is now just over a year since The Rana Plaza in Bangladesh collapsed.In that tragic incident, 1129 garment workers were killed and thousands more injured. They still haven’t received proper compensation and more than half of the companies who bought from the factories have not yet even pledged any money to the compensation fund. This building housed four clothing factories that supplied goods to 29 international brands and retailers, including (according to the BBC) JC Penney in the United States and Primark in the UK, plus Benetton (The Guardian), Matalan, Bonmarche and Monsoon (The Irish Independent), Walmart and Gap (International Business Times). So, buying more expensive clothes on the high street does not necessarily ensure that the people who make them do so under good conditions. Of course, clothing is not the only industry that does not always take care of its workers… I have written previously, for example, about the appalling conditions associated with the production of cut flowers in poorer countries and the exploitation of the workers. What all this highlights is that the ‘cost’ of a product is so much more than the money that you hand over in a shop. And because the things we buy are cheap, we do not value them – we often throw them away before they have reached the end of their life… because businesses want us to keep buying and making profit for them. If you personally knew people who worked in terrible conditions, would you buy the goods they made and support the companies who exploited them? So, next time you go shopping, think about the implications of your choices… do you want to be responsible for the suffering of another person? Is there a purchase you can make that would be a positive action instead? You’re right that we don’ think deeply enough about the people who make what we use.Most of us were horrified at Rana Plaza, but I’d be worried about what happened to them with no jobs if we stopped buying. I think we need to create online petitions to present to the shops that sell these goods to apply pressure to the manufacturers to look after the workers in conditions of work and in pay. They do have a lot of clout as they can withdraw from bad companies. Just as a point of interest ( to me anyway) I buy a lot of Fruit of the Loom Teeshirts from ebay so that I can iron on pictures. I have Ju close to my heart all the time and take a lot more care of the garment now including the washing and ironing. They make great gifts with all kinds of images on, photo’s from family archives, family holidays and even cartoons if you have a good clipart programme. It’s a lovely way of making a gift really personal. I’m a great supporter of putting my money where my mouth is and try to buy from already ethical suppliers who care for their workers. As far as the Rana Plaza goes, the buyers have responded in a variety of ways: Primark claim to have taken action to improve the situation and have certainly donated £7 million to the compensation fund; in contrast Matalan have paid nothing! … and ironing… I try to avoid THAT whenever possible!!! This a brilliant and thought-provoking post from The Snail of Happiness, over in the United Kingdom. The last line, in particular, is of relevance for The Carpenter’s Shop and what purchasing a product from our workshop really means at grass roots level. Thank you Jill… I think people who make things themselves tend understand the value of products and what ‘cheapness’ actually implies… let’s spread the word! And if you make some of your own clothes you are not endorsing their production in poor conditions, even if it does actually cost more to buy the fabric and pattern. It’s interesting to note, however, that ironing can prolong the life of clothes by smoothing and aligning fibres! Oh, don’t say that… I’ve got used to being crinkly! We should, however, wash our clothes less often and gently to make them last longer… the joy of no-rinse wool wash like Eucalan cannot be over-emphasised! I don’t do a lot of wool washing, obviously, and things worn in our climate need to be washed every time they’re worn, especially shirts, etc, but I use minimal quantities of detergent and economy washes. And no tumble drier unless we’re in the middle of the Wet, when nothing will dry unless you use the drier. But truly, ironing does make cotton especially last longer! A rather different set of challenges in the tropics! My sister’s new super water and energy-efficient washing machine has a 15-minute cycle for ‘freshening’, which seems like a good option for both the environment and the clothes (when appropriate). The washing machine I have in my flat here in Lima is destroying my clothes, so I wash as infrequently as possible, which is still more often than I wash back home, thanks to the high humidity and airborn pollution. Really makes me value my low-water use front-loader washer back home, and the phosphate-free eco laundry powder that comes in a cardboard box that lasts me a year. I go through so much more plastic here just through lack of options! I, too, am having to use a tumble dryer for the first time in my life due to humidty that hovers above 95% for months on end. Unlike in the midst of a wet Tasmanian winter I have no wood heater to dry my washing in front of! We are so privileged in the Developed World to be able to even make these choices. Here I have far more limited options (if I lived on my own I could do more than I can in my shared flat, but still nothing like my lifestyle back home). The clothes, at least, generally come from very poorly-paid Peruvians and Bolivians, who are exploided by Chilean department stores, and nothing is made to last, so I’m wearing my Tassie stuff until it falls apart and only buying what I need here to get by. Oh, and lashing out a LOT of money on beautiful, hand-woven textiles coloured with natural dyes, bought directly from the weavers. Not really a viable solution for my holey underwear or worn-out work blouses though! Yes, I’m very grateful to actually have choices here. It’s easy to forget, when I live in such privilege, how difficult it is elsewhere. I just hope your underwear lasts the next six months!! Sadly, there doesn’t seem to be an easy way to identify which retailers rely on sweatshop labour other than looking for those who claim to be ethical in some way. I suspect that most brands that do source ethically will shout about it because it’s good for marketing… but perhaps I’m just being cynical! One of the things that many people here in the United States tend to forget is that it wasn’t that long ago that we were one of those countries. That we had those appalling conditions here until the unions came along and demanded better working conditions, and enforced labor laws. But we didn’t want to pay the price for those laws, so companies went abroad for labor. Workers want better working conditions, but consumers don’t want to pay the price for them. The interesting thing is, the workers and consumers are the same people. Yes, the conditions are appalling and should not be allowed. I agree with that with every fiber of my being. It’s sad to say, but making your own clothes doesn’t always help the problem unless you know where your cloth is woven — usually in the same countries. I generally buy used clothes from charity shops because my size tends to fluctuate too much to spend a lot of money on clothing. But there are times when I’ll wander in to a shop and buy clearance. I don’t pay too much attention to where the clothes are made because if you look at the tags of many of them the fabric comes from one place, they were assembled somewhere else, and distributed in yet another country. It’s too much to keep up with. I don’t shop at JCPenney’s though for many reasons. Buying from charity shops is a great way of ensuring the maximum use out of labour and resources… good for you! If I buy fabric, I do try to source Fairtrade… tough to find, though. Since Grace was quite small, we’ve been teaching her that her money is a vote. She can choose to vote for oppression and slavery and poor treatement of others…or she can vote for treating people well. (In our house, slave-free chocolate is a big deal.) Sadly, it is just so hard to tell if you’re actually buying something that you would want to support. You are so right about the problem of not knowing… it’s not always possible to do the right thing, but it’s good to try! Do you remember the Naomi Klein book I got you a few years ago? ‘No logo’ went into great detail about the way both workers and the environment are exploited around the globe by large corporations. The sad thing is, this book shone a spotlight on the subject 15 years ago and nothing has changed. Too true. It’s hard to be confident in your buying choices, sometimes, especially when money is tight. Well, at least we are trying! Really great thought-provoking post. I try to buy most of my clothes second-hand but it’s definitely still worth thinking about who made them in the first place. According to Clothes Aid ‘In the UK, we wear an item of clothing on average for less than a third of its useful lifespan’. When you remove anonymity and get up close and personal with people who provide your food and services you are forging community. The more we interact, the less distanced from our local community we become. The less we buy from sterile supermarkets and delve into real food, real products that someone has laid hand to rather than a chattering mass of machinery (or more to the point robots) that has boshed everything together within an inch of it’s life and all the same…all sterile… the more we understand that we are all connected and that everything that we do leaves an indelible mark on the world and on us and those around us. Even worse when what we are buying for peanuts is paid for by someone elses anonymous misery. Wages that none of us could even contemplate living on that piece together a meagre life so that we can prance about in designer gear feeling pretty clever about how far up the ladder we have managed to climb…awareness brings the chance to sit down and take stock of our own actions and where they fit into what happens in the world. Do we need that scarf that some poor child who will never see the inside of a school has slaved over that we picked up for a pound off a rack and will probably give to a thrift shop next season? Why not pay someone what their labour is worth and get something beautiful instead?